ViewRanger has teamed up with BBC Countryfile Magazine to bring its popular Great Days Out feature to your smartphones and tablets. Digital route guides for the routes in BBC Countryfile Magazine's 'Great Days Out' section are being published through the ViewRanger app to coincide with each printed magazine’s publication. 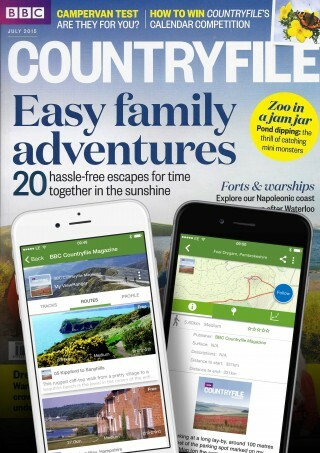 “Using ViewRanger has helped BBC Countryfile Magazine to make rich digital route guides, mirroring those included in our Great Days Out features, easily accessible to its readers on their smartphones. The back catalogue of routes can be accessed by searching for 'BBC Countryfile Magazine' in the app's search tab, and clicking on their profile. ViewRanger has also recently introduced route collections into the app, enabling you to find routes grouped by publisher or theme. BBC Countryfile Magazine readers will be able to find the magazine’s latest routes in issue-specific collection in the ‘discovery’ tab within the app, an area dedicated to discovering information-rich trail guides worldwide. Magazine readers can download the routes by scanning the QR code printed by each available route in the magazine. (If you'd like to do this, you'll need to download a free QR code reader from your phone/tablet's app store). If you open this link on your phone, you will be able to open the collection up directly in ViewRanger, making it super-easy to download the routes.